This week on Lake Okeechobee the winds have been from North / Northeast at 5-10 mph and the water temp is in the low to mid 80’s. The water has come up some more with all the rain and the water is dark now all over the lake, but the clarity is good. 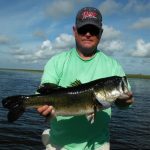 This week the morning bite is still in the Kissimmee grass with a white Swim Jig and a Spinnerbait, If you have some cloud cover it will last up to 09:00. Then I have been Flipping the outside grass lines and moving into the inside. Keep in mind with all the water we have had that these fish are still pretty scattered. Good baits to Flip/ Pitch is a Black/Blue jig and a overhang craw worm with a 1/2oz. weight in the same color. Good areas to fish are Kings Bar, 3rd Point, and the Lakeport area of the Lake. Here is a picture of my buddy Joe with a 7lb bass that we caught this week.